Mr. Aleksandr Dubrovskyy was born in 1949 in Oryneno, Khmelnytsky oblast, Ukraine. He started painting early. Painting was his most favored occupation, beyond all usual boyish interests and activities. At 7 years he was admitted to the art school for children in Yenakievo; at 16, Aleksandr entere d Kharkov College of Art (1965). 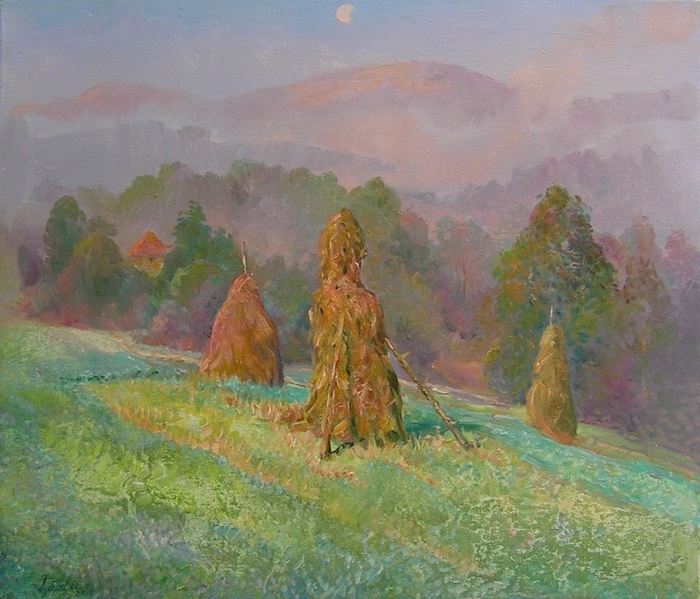 In 1969, graduating from the College of Art, he travels a lot and works assiduously on portrait and landscape painting. 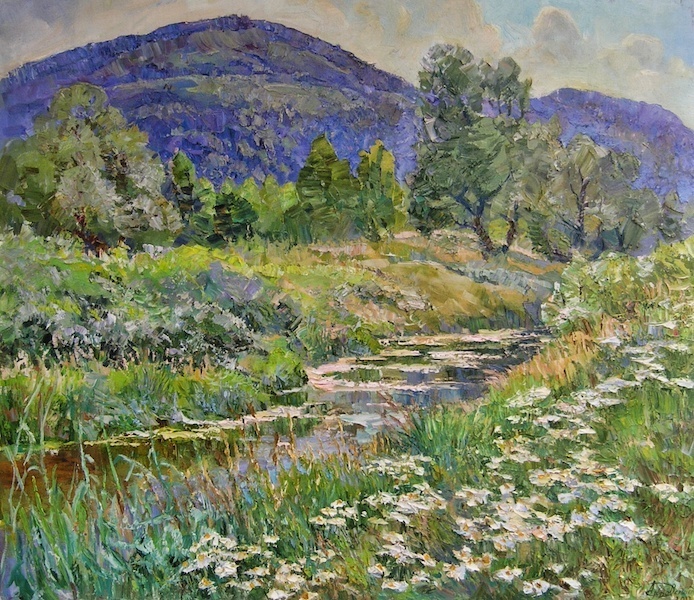 His perennial work at the academic villa in Sednyov offered Aleksandr a happy and unique opportunity to work together with, and learn from, such eminent painters as Konstantyn Lomykin, Fedor Zakharov, Nikolay Glushchenko, Viktor Shatalin, and Tatyana Yablonskaya. They have deeply influenced his artistic formation. Sednyov… this marvelous nook of Ukraine became the artist’s creative workshop. Mr. Dubrovskyy’s early works are bearing a noticeable mark of impressionism. This style will become one of the dominant in his later works. The sphere of his artistic interests is very extensive. He paints colorful landscapes, still life, genre pictures, and executes monumental orders. His whole life will be embraced by this parallel: painting and monumental art. 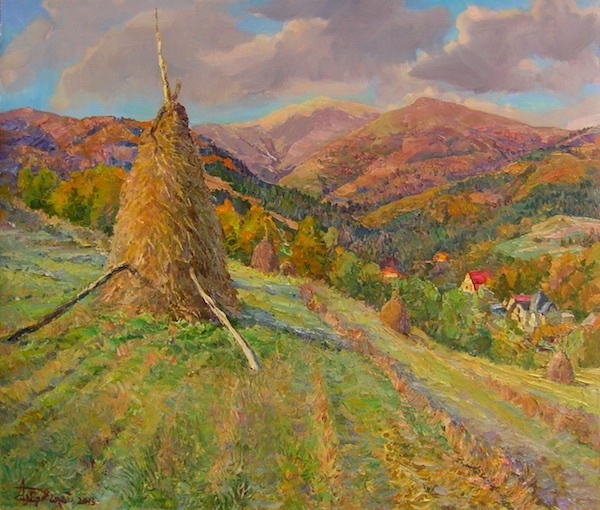 Since 1972 he participates in personal and republican art exhibitions in Ukraine. 1973-1975, participates in international art exhibitions in Japan (Tokyo, Kyushu) in Ms. Nakamura’s galleries. 1976-1985, as member of creative groups, participates in multiple trips to development areas of Far East, metallurgical works, and Druzhba gas pipeline construction area. 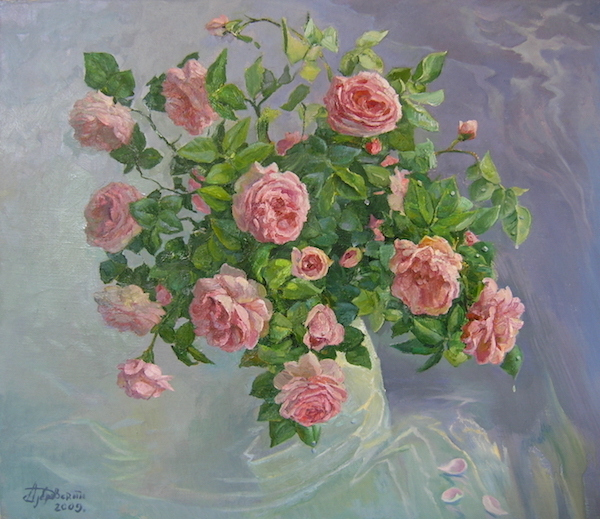 His works in this period are exposed at renowned art exhibitions of Soviet Union. One of the paintings of this period, "12-pump plant”, is exposed in Art Museum of Gorlovka, Donetsk oblast. 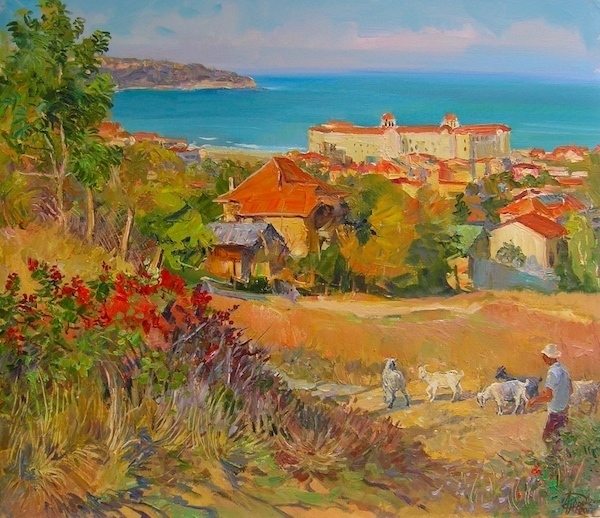 Since 1987, member of the prestigious Union of Painters of Ukraine. 1985-1993, creative work and personal exhibitions in Algeria. Algerian exotics made an overwhelming impression on the artist. He was avidly capturing every image: people, customs, strange beautiful nature, animals, colors of the sea and skies. Surrounded with the picturesque enchanted landscape views, the vivid colors, and originality of this country, Mr. Dubrovsky creates a series of mind-blowing pictures, such as "Sahara Desert”, "Desert Roses”, "Wedding Caravan”, and others. In 1992, together with a group of painters from Saint-Petersburg, participates in art exhibition held in ARCOLE gallery in Paris. The abbot of St. Mina Copt Orthodox Monastery invited Alexander Dubrovsky to Egypt to create a series of genre works of encaustic tiles. Before he proceeded to making the mosaic works, Mr. Dubrovskyy visited museums and temples of Italy and Egypt. In Italy he was in awe of mosaic works of old age artists, and the specificity of Copt iconography, all subject to stylization and symbolism, impressed him like the art itself caught in its momentum. Considering the art to be the embodiment of all the best things ever created by the mankind, Alexander decided to introduce drawing and color into his works. His intent was favored with the great color diversity of encaustic tiles available in the monastery, and he was able to fulfill his dream to execute mosaic works in "impressionist” style. Roman and Florentine mosaic becomes a new direction of his creative work. One may say that it was God’s hand that led Aleksandr Dubrovskyy to St. Mina Monastery. …In 3rd century Mina dismissed from his military officer service in Algeria and retired to desert, undertaking the labor of fast and prayer. He had a vision of Jesus Christ who fortified him and told that after his death in that place a church would be built where miracles and healings would be worked. From 1995 to 2004 in the rebuilt St. Mina cathedral Aleksandr Dubrovskyy created genre mosaics of biblical scenes: "Agony in the Garden”, "Christ the Pastor”, "Flight into Egypt”, "Christ’s Entry into Jerusalem”, "Israelites crossing the Red Sea”, as well as worked on the dome, ornaments, and naves. The monastery where those mosaics were installed is protected by UNESCO. In 2003-2006 Alexander Dubrovsky made mosaic scenes in St. George cathedral of Vydubytsky Monastery in Kiev, Ukraine (St. Princess Olga, St. Prince Vladimir, Venerable Sergiy of Radonezh, Great Martyr Varvara, St. Ksenia the God’s fool of Petersburg, Great Martyr and Healer Panteleymon) on invitation of the abbot, father Sebastian. For all these years, combining his work on easel painting and mosaic, Alexander has been conveying a vast and varied gamma of color nuances of great purity, which he considers to be indispensable for creation of expressive and substantial artistic images. It is a true symbol of passion, love and harmonious love relationships. 100% HANDMADE OIL PAINTING ON CANVAS. READY TO SHIP WITHIN 3 BUSINESS DAYS FROM Ukraine or Germany !!! YOU WILL RECEIVE EXACTLY THE SAME PAINTING AS PHOTO !! Looking at the meadow, you want to move on the other side of the picture and trample this carpet of flowers barefoot…?